Our research applies methods of computational quantum mechanics to elucidate the electronic structure and magnetic properties of molecular and biomolecular nanostructures. Recent experiments suggest that electronic spin can be used to control and manipulate the electrical conductivity and other properties of potential molecular-based electronic devices. Our aim is to understand, from first-principle electronic structure calculations, how spin degrees of freedom can be used in conjunction with molecular systems to design useful molecular spintronic devices. Iron core of the molecular magnet Fe8. The spheres represent the iron ions and their arrows illustrate one of several possible ferrimagnetic orderings which can lead to the observed S = 10 molecular ground state. Several transition metal-containing molecular nanostructures of intermediate nuclearity have been synthesized. These structures contain on the order of 10 metal ions and have novel physical and magnetic properties which are favored by their mesoscopic dimensions. Displaying characteristics which are borderline between those of simple paramagnets and those of bulk magnetic materials, these transition metal-containing molecular nanostructures have attracted considerable interest from physicists, chemists and material scientists. The theoretical investigation of "molecular magnets" is of interest not only due to their novel properties, which are borderline between quantum and classical phenomena, but also due to their potential technological applications which range from quantum computing to memory storage devices. In fact, the magnetic bistability found in several molecular magnets can potentially permit storing data at an extremely high density by localizing each bit of information in a single molecule. Prominent examples are the ferrimagnetic nanostructures known as Fe8 and Mn12 which exhibit quantun tunneling of their sublattice magnetizations (macroscopic quantum tunneling) and magnetic hysteresis not given by long-range-order interactions but having a purely molecular origin. Athough much experimental and theoretical effort has been devoted to understanding spin dynamics and tunneling rates in molecular magnets, little attention has been given to the first principle calculation of their electronic structures and to the computational prediction of their magnetic properties such as magnetic anisotropies. Our efforts are devoted to understanding the detailed electronic configurations which ultimately give rise to the observed magnetic properties of molecular magnets. Such understanding can significantly contribute to the work of synthetic material scientists who try to engineer molecular magnets for potential technological applications. (a) The double-helix structure of DNA consists of two linear strands with four bases ­ guanine (G), cytosine (C), adenine (A) and thymine (T). The A bases on one strand pair up with the complementary T bases on the other strand, while G pairs up with C.
DNA has a crucial role in biological systems as a carrier of genetic information. More recently, however, some experiments suggest that DNA can also be seen as an efficient "molecular wire" which offers virtually no resistance to electronic conductivity. 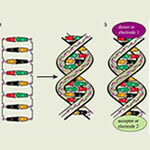 We are interested in elucidating, by means of computational methods of electronic structure, the possible pathways for electron transfer which give rise to the conduction properties of DNA. 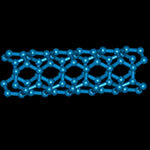 Single-Walled Carbon Nanotube of (3,3) Chirality. Single walled nanotubes (SWCNs) are carbon-based nanostructures with remarkable electronic properties. The small diameter of SWCNs gives their physical properties a quasi one-dimensional character. That is SWCNs can be regarded as one-dimensional quantum wires. SWCNs are thought to be potentially useful in the design of nanoscale electronicdevices and, due to their mechanical properties, for developing strong polymer-based materials. We are studying the electronic structure of nanotube models to establish some correlations between their geometric structures, density of states (DOS), and characteristics of their valence and conduction bands. We are particularly interested in studying possible magnetic properties, such as intrinsic spin polarization, which is believed to occur in some heterostructured (doped) nanotubes. Such heterostructures may serve as "spin-polarizers" during electron transport. 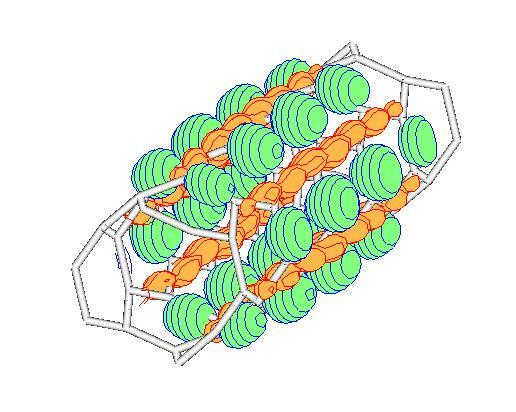 The figure shows a delocalized one-electron valence state that we have obtained from density functional theory (DFT) calculations on the (3,3) nanotube shown above. 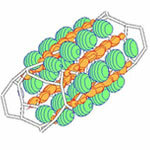 The one-electron density spans the entire nanostructure indicating that the molecular geometry allows, by itself, intrinsic delocalization whereby some valence electrons are completely delocalized along the axis of the nanotube. Copyright © 2019, Purdue University, all rights reserved. Purdue University is an equal access/equal opportunity university. If you have trouble accessing this page because of a disability, please contact the Physics Webmaster at www@physics.purdue.edu.